As you know, the Festive Season is fast approaching! 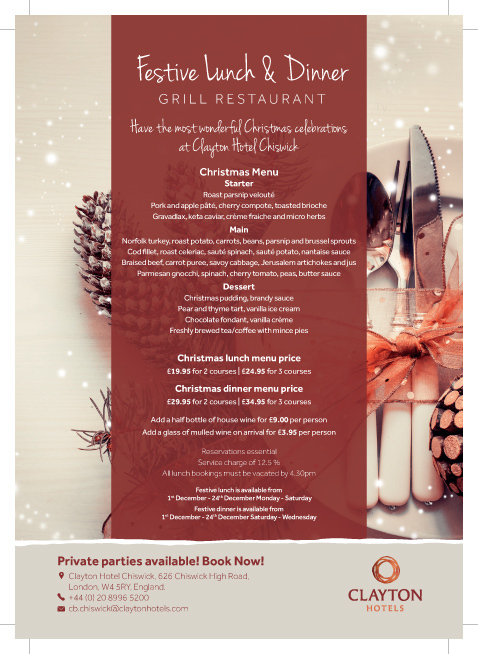 Why not celebrate this special time with friends or colleagues, and join us at the Clayton Chiswick, where you’ll have the most wonderful Christmas Celebrations. For details, please see our information leaflet attached. To make a booking or an enquiry please contact cb.chiswick@claytonhotels.com or call our dedicated Events Department directly on +44 (0) 20 8996 5200.